Young Poets Network chats to Kaiti Soultana, winner of the inaugural 2013 Poetry By Heart competition. Kaiti wowed the judges – including Sir Andrew Motion, Alice Oswald and Daljit Nagra – with her recitation of Elizabeth Bishop’s ‘The Fish’ and Sir Gawain and the Green Knight in the original Middle English. Here she discusses the benefits of learning poems off by heart, how to go about it, and beating stage fright! What drew you to the poems The Fish and Sir Gawain and the Green Knight? Sir Gawain was the first poem I chose, and I think it was because it seemed the most haunting. I really enjoy exploring and immersing myself in something new, and this seemed like the perfect challenge. I then flicked through the other poems and it seemed as though, to me, ‘The Fish’ had the most beautiful ending. It’s a poem that seems to really evolve, and I loved that. You bravely chose very complex poems – how did you set about learning them? It took me a while to get my head around the pronunciations and dialect of Sir Gawain and I had to look up a few guides on the internet for that! I have a relatively long walk to my bus every day to college, and once I understood how to say the lines, I began learning one or so a day by repeating it over and over, adding it onto what I had already learnt. It seemed the best way for me not only to remember it, but to explore different ways of saying it. Now that I’ve repeated so much of both poems, they truly seem embedded into my subconsciousness! Does learning and reciting by heart add to your experience of the poems? Yes, definitely. It really makes you focus on what the poet is presenting, as well as adding your own take to them. Did learning the poems and saying them out loud give you any ideas for your own writing? I think that one of the greatest benefits to my own writing from learning poems is that learning and reciting poems allows you to explore different types of writing, and what types of sounds are good to listen to. I’ve learnt not to limit myself when writing to solely the meaning of words, but to consider and value the sounds that are associated with these ideas and mould them within my writing. Can you give us three top tips for learning and reciting poems? Repetition! Keep going over and over what you need to remember every spare moment you have. It really helps to embed it into your mind. Say lines in different ways – I tend to remember better if I enjoy and appreciate the lines, and exploring different ways of saying them helps with this. Writing the poems down helps you visually remember which lines come after which. It also helped me learn the Gawain poem’s spelling! How did you make your reading so dynamic? Where do you think the balance lies between acting and reciting? I think the key for me was to keep my body still and ensure my face was what was captivating the audience, from movements of the head to flickering your eyes on preselected lines. I think it does depend on the poem, and there are plenty of poems that I think would benefit from more movement, but the ones I had selected allowed me to refine the expression within the poem. We read in your article for Oxford University Press that you get nervous, but you don’t seem it on stage! How do you deal with stage fright? It was strange, because reciting poetry has probably been the most nerve-wracking experience I have had! I held my hands together, which seemed to focus my nervous energy. I act, and am a real believer of focusing and targeting energy. I also felt that looking individual audience members in the eye acted as though I was facing my nerves, which was probably what made me seem braver! Did you have fun at the competition? It was nothing short of amazing. The whole weekend was incredible, from the competition itself, to the activities in between and the community buzz between competitors. I could not more highly recommend and praise Poetry by Heart, and I hear the same from fellow competitors! What was the last poetry book you read, and what did you think of it? It was a collection of Browning poems. Browning seems a very meticulous poet and I love exploring the deeper reasoning and meaning behind his works. I love having to work and engage with the poem to decipher deeper possible meanings! My favourite was the famous Porphyria’s Lover. You’ve said that you learnt the medieval English as a challenge, because you’d never done it before – what’s the next challenge you’re going to set yourself?! Well, I’m taking a gap year in September and will be applying to university too! I guess onto a course I love would be my next, almost long-term challenge! Wish me luck! Poetry By Heart 2014 is now closed. 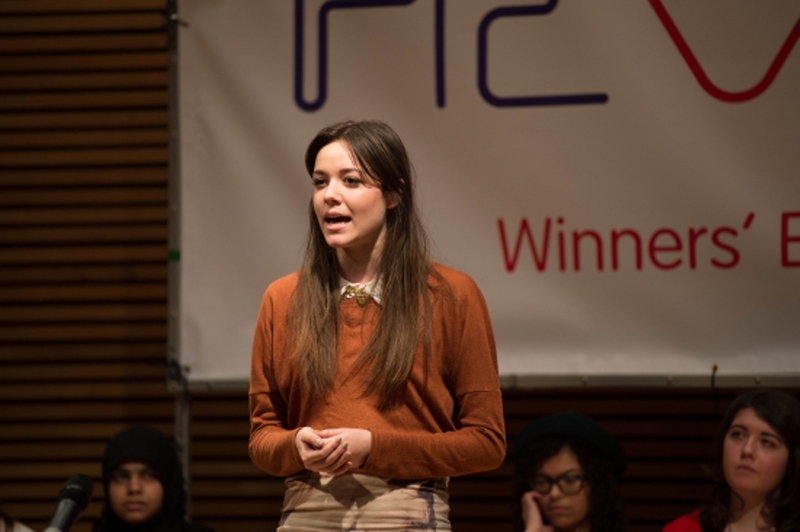 You can see Kaiti and other finalists performing their work on the Poetry By Heart website. Kaiti Soultana is an 18 year old student about to begin her gap year having finished studying English Literature, English Language and Economics at Bilborough College in Nottingham. An avid performer, Kaiti is a member of BAFTA award winning Television Workshop, Nottingham Playhouse Young Company, and is about to undergo training to become a member of the National Youth Theatre. Kaiti is hoping to study English and Drama at university, following a year of exploring literature, performance and cultural current affairs. Hi Baynes, most challenges are open to any young poets under 25 from all over the world. If not, it will clearly state that it’s only open to UK poets.